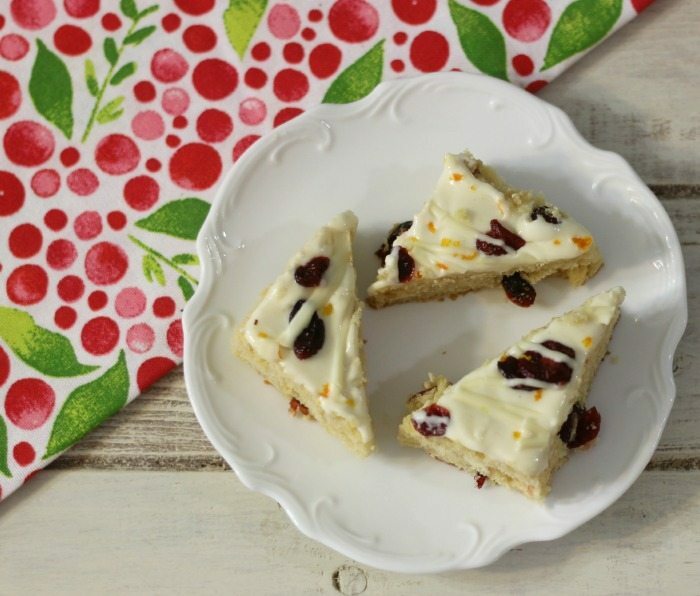 Now that the holiday season is here, there are a few goodies that my fellow co-workers just love, which is the Starbucks Cranberry Bliss Bars. I never had one until this year. They are amazing! Sweet, delicious and high calorie. Each one at Starbucks comes in at 340 calories. That is way to many calories! So I decided to make a copycat version of the recipe which means fewer calories. These bars come pretty darn close. Mine are a little thicker than Starbucks, only because I used a 9 x 13 pan. If you have a bigger pan you will have a thinner bar. 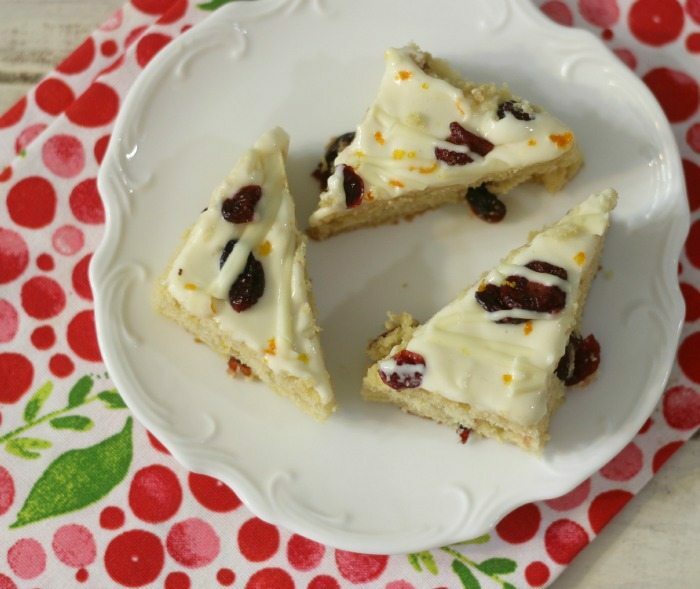 The base of the bar is a shortbread cookie chock full of white chocolate chips and cranberries. 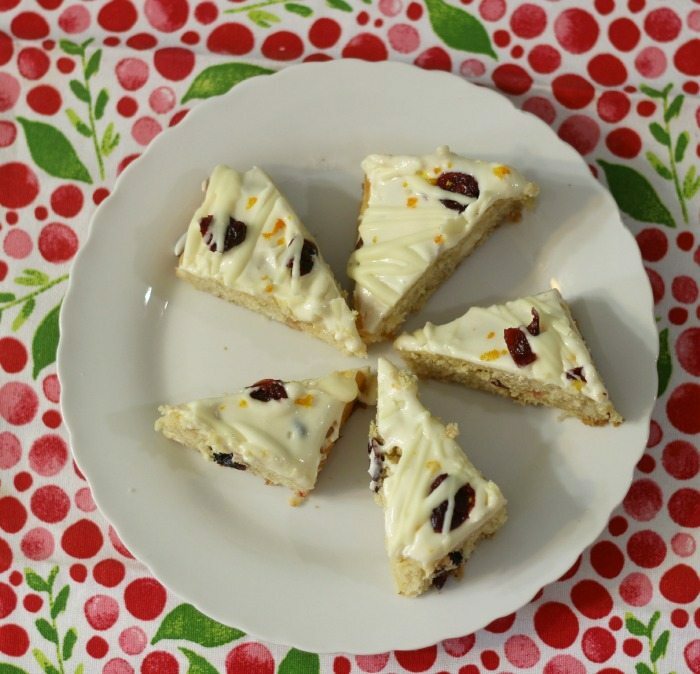 It’s topped with a cream cheese frosting with orange zest and more cranberries. Then of course I had to put a drizzle of white chocolate on them. I’m pretty stoked about these bars. I gave a bar to my Husband and he said they are good but taste like a Christmas Cookies. Well, duh, it is a Christmas bar! So with a little less sugar, reduced fat cream cheese, these bars came in at 130 calories. Even if you didn’t cut the bars in half, you are still looking at fewer calories and sugar than Starbucks If this is one indulgent you like to treat yourself during the holiday time, I highly recommend making your own. You will be pleasantly surprised on how wonderful they taste. 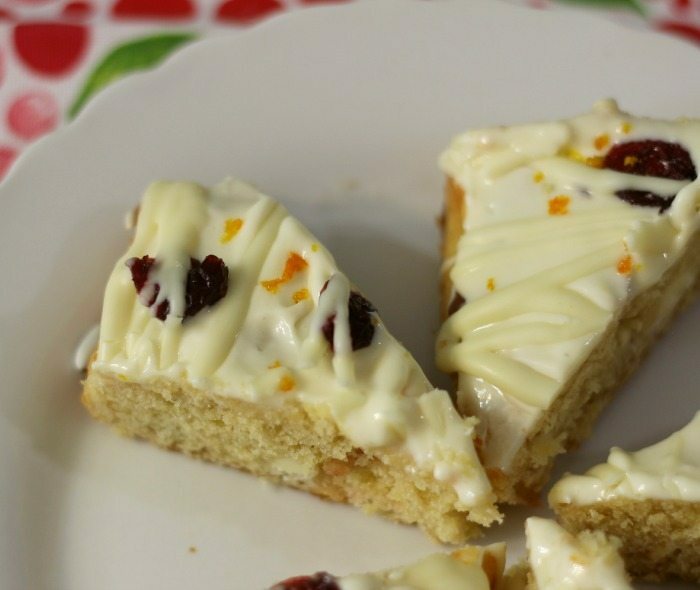 Short bread cookie base filled with white chocolate chips and cranberries, topped with cream cheese frosting and drizzled with white chocolate. Line a 9 x 13 baking pan with parchment paper; set a side. In a medium bowl add flour, baking powder and ginger; set a side. In a large bowl, beat the butter, brown sugar, granulated sugar until creamy. Beat in eggs and orange extract until just blended. Add flour mixture and beat until just combined. Stir in cranberries and chocolate chips. Spread batter evenly into prepared baking pan. Bake in oven for 15 - 18 minutes until lightly browned and center comes out clean with a toothpick. Let the bars cool in pan. Once cooled, take out of the pan, by grabbing the edges of the parchment paper. To make frosting: Beat together cream cheese, butter, confectioners sugar and orange extract; until light and fluffy. Spread frosting over bars. 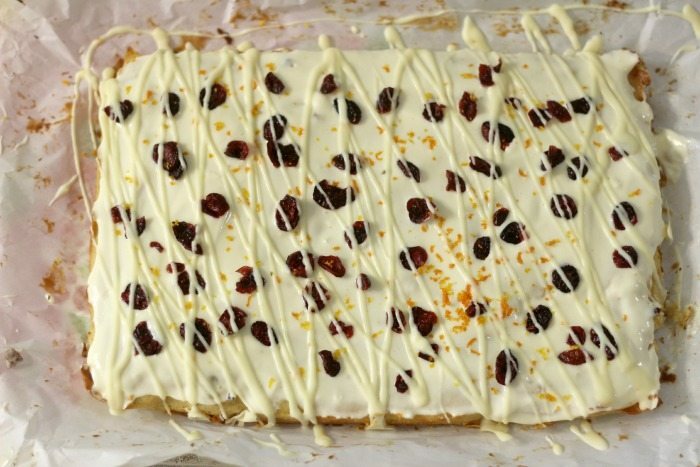 For topping: Sprinkle bars with cranberries and grated orange. Melt white chocolate chips and canola oil in a microwave safe bowl for 30 seconds, stir. Do this for 15 second intervals until chocolate is melted. Drizzle melted chocolate over bars. Let the bars rest for 30 minutes and cut into bars. To make signature Starbucks triangles, cut into 20 large squares (5 cuts by 4 cuts with the knife). Then cut each square in half diagonally to create triangles. I found they are best to keep in the refrigerator. I truly can’t believe how good these taste compared to Starbucks. Plus did you know that a package of Bliss Bars from Starbucks costs $13.95? That’s insane! I am happy to make my homemade version. They may not be as pretty as SB but they taste just as good! I made these last year from the skinnytaste website, but after calculating the points, yours are lower. I’m definitely making these this week. Thankfully, I gave up Starbucks over a year ago and haven’t regretted it once.